Research shows that pumping up the jams in stores is a key component in creating a holistically appealing shopping environment. Research shows that pumping up the jams in stores is a key component in creating a holistically appealing shopping environment. The right songs—not to mention their beat, volume, variation and more—can not only have a positive affect consumers’ moods and keep them browsing longer, but a specialized soundtrack will help differentiate a store from its competition. At the very least, strains of a rockin’ song can pull music-loving customers through the doors. 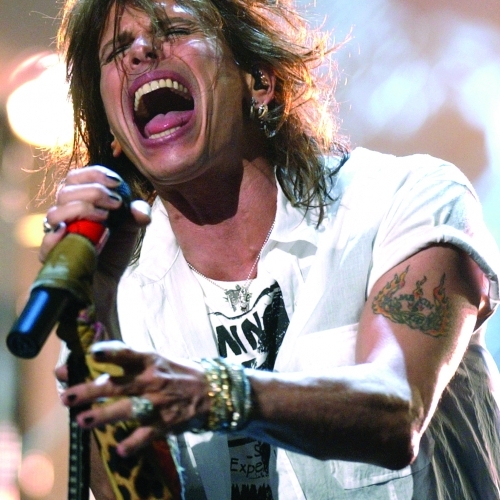 So kudos to Famous Footwear for tapping Aerosmith’s Steven Tyler to determine the playlist for 985 of its North American stores. The retail chain (a division of St. Louis, MO-based Brown Shoe Co.) has invited up-and-coming musicians to submit songs via Sonicbids, a promotional music Web site. Tyler and other celebrity judges—including songwriting legend Livingston Taylor and John McMann, senior vice president of Atlantic Records—will review all entries and curate a song list for the family shoe chain, hopefully inciting consumers to linger while helping launch some up-and-coming bands. This year may well be remembered as the Year of the Cutback. In art, entertainment, travel, footwear and many other goods and services industries, suppliers have curtailed, stripped down and (in some cases) downright cheapened their respective offerings as a first line of defense against the Great Recession. Unfortunately, less is not always more, especially when one does not pay any less for that sub-par version. That’s why it was so refreshing to see U2 go over the top on its recent tour stop at Giants Stadium in New Jersey. It seemed no expense was spared—from the impeccable sound system that made the audience feel one with the music to the sheer rock ‘n’ roll spectacle that is the band’s part-spacecraft, part-cathedral stage—complete with an enormous video screen that put even those stranded in the nosebleeds right in Bono’s lap. I, for one, got my $98’s worth, which was about the price I paid the last time the band came around a few years back. In fact, I got more bangs, riffs and wails for my buck—a surpassing of expectations that, after a year of receiving less, was a breath of fresh air. The sheer enormity of the U2 concert is a stark contrast to the Metropolitan Opera’s latest rendition of “Tosca,” which was reportedly met with a chorus of boos on opening night. The stripped-down set (one reviewer likened it to a dank church basement as opposed to the Sistine Chapel-like backdrops of previous productions) coupled with shaky performances left the city’s opera-going elite feeling gypped. Many attendees paid the same amount, if not more, for a show that clearly suffered cutbacks on set designs and talent. One can only assume that the bad reviews will have an equally adverse impact on future ticket sales, which begs the question: Were the cutbacks really worth it? Soon after “Opera-gate,” I read a report stating how several airlines will tack on a $10 surcharge for those flying during key holiday travel days, which comes atop those periods’ already jacked-up ticket prices. And that’s in addition to the surcharges for extra bags, not to mention the cutbacks on complimentary meals—hell, you’re lucky if you get a free bag of peanuts. There is simply little enjoyment in flying these days, other than arriving in one piece. I dread the day the bean counters look at safety as a cost savings. Wait, they already are, which begs the question: How could that ever be worth it? Thankfully, any cutbacks related to footwear production are not matters of life and death. Nevertheless, consumers will not respond kindly if shoes that cost the same or more don’t hold up as well. It has been well documented how Americans have been scarred by the recession and, going forward, will no longer buy with wild abandon; now frugality and quality rank far higher on the decision-making scale than impulse and greed. But here is one instance where a resulting cutback actually might be a good thing. Word has it that the shotgun production approach to line making is being replaced with a less-is-more strategy intended to meet the demands of increasingly discerning shoppers. Rather than, say, 50 styles where half may not be so hot, the decision is to make only the 25 styles that possess real value. The overall cost to manufacture is lowered and the quality level of the styles that do make the cut can be enhanced. The result: retailers are choosing from a better pool of potential sell-throughs and consumers are rewarded with a better selection of styles. That begs the question: Why would the industry not approach production this way? This fewer-but-better concept is as refreshing as the U2 concert: Dazzle with unique, high-quality designs rather than drown in me-too mediocrity, and leave your fans screaming for more. It surely worked for U2.